I only have one this week! Tom Taylor's Friendly Neighborhood Spider-Man has been an awesome series so far, but I knew Taylor would deliver. 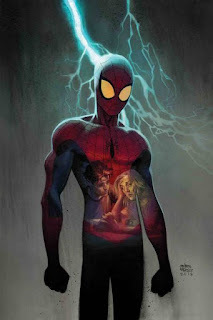 I've really enjoyed his take on Peter Parker. It's refreshing, but also familiar. Synopsis (via Goodreads): One creative middle-schooler schooler discovers that the best friend a girl can have is the one she makes herself in this charming magical realism read. I think Friend or Fiction will be a fun, and potentially educational, story for me to read to the kiddos. I know my two-year-old girls don't necessarily understand jealousy, but we've been working on sharing (they don't really care for it). My son is interacting with more kids his age these days (soccer, jiu-jitsu, etc. ), and we've had a few talks about playing well with others. He's supposed to be kind even when dealing with unkindness, because sometimes people don't know how to express their thoughts and feelings the right way. Life lessons! Oh like the sound of Friend or Fiction. Definitely a good one for the kiddos! I hope it's as good as it sounds! I like it when books have an educational aspect, or help teach children a better way to handle bad situations/feelings. I think it gives them something to reflect on when faced with similar issues. I have an ARC of Friend or Fiction and I am all about it. I love stories like this, and I have been adoring all the MG books I have been reading lately. I feel like you always have the books I'm most looking forward to reading, haha. I guess that's why I love following your blog so much. ;) I've been getting more into MG since I stared reading them to my son at night while he falls asleep. We went through my favorites (Harry Potter, Percy Jackson, Artemis Fowl), and I've been looking for new stuff! Gregor the Overlander was an amazing book and series, although Collins likes to crush people's hearts. Ooh I like the cover for the Friendly Neighborhood Spiderman, I'm starting Justice League VS Suicide Squad Vol 5! Awesome! Do you read more DC than Marvel, or do you like both? Most of our stuff is Marvel, but I like a lot of Boom! Studios, IDW, and Image. Titan Comics also has interesting stuff from time to time. I believe that's what published V.E. Schwab's series. I read DC comics a bit more than Marvel, but it really just depends on what Marvel comics I can get a hold of. I tend to like the DC comics better, and the Marvel movies better. If you have a chance to read West Coast Avengers by Kelly Thompson, I highly recommend it! Also, All-New Wolverine by Tom Taylor. It's not ongoing like WCA, but it was a good run. Oh! Jody Houser's Amazing Spider-Man Renew Your Vows (also over, but amazing). Argh! I'm sorry. I totally forgot to add the linkup! My brain must have temporarily fritzed. I'll add one momentarily! I just have to finish mowing the lawn first, haha. Friend or Fiction sounds amazing! I cannot wait!! Okay, it's there now. Sorry again! Also, do you know of another site that allows you to create linkups like this one? Inlinkz has updated their site, and I'm not a fan of the new format. 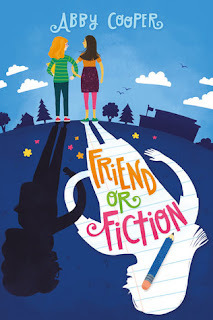 friend or fiction does sound cute! I didn;t know you were a mom of toddlers! That's such a fun age! I miss it! 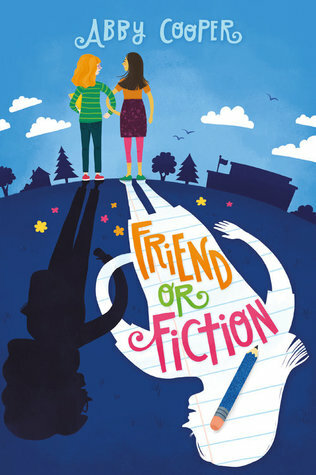 Friend or Fiction looks adorable.